This 13 Ming Tombs (Shisan Ling) Site Map gives a general overview of the entire Ming Tombs Valley and Site Area. 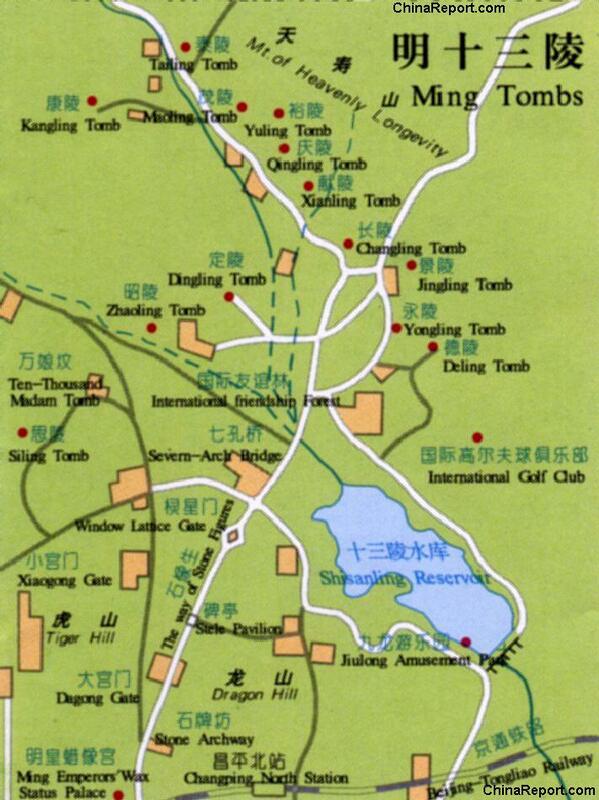 The entire map area is locally referred to as Shisan Ling which is Mandarin Chinese for 13 Tombs. The Tomb Valley is located some 50 kilometers North of and Outside Beijing proper near the Badaling Pass and Great Wall of China just 8 kilometers away in the surrounding Jundu Mountains. Ming Tombs Valley and all Tombs are reachable by round trip bus from several points in the City Center, by booking Group Tour or by hiring a Private Cab for at least Half a Day. One can of course always drive there oneself. The designated parking is depicted on this Map. All Ming Mausoleums /Tombs depicted on Map.